Ronald Rotich is 34 years old, and was born in a small village called Tuiyo, which is on the outskirts of Eldoret, Kenya. He is a born again Christian and a family man with a wife and two children. Ronald’s education came from Kormaet primary school and then high school at Cheptil, where he was a good student. Ronald’s mother was a single parent and he lived with his grandparents who also paid for his high school education. Ronald dreamed of college but that was put on hold due to his grandfather being diagnosed with prostrate cancer and he could not afford the college fees. Ronald started a small farm directly after finishing high school and also works as a porter at the Eldoret International Airport and as a driver. This is where Ronald first met Pastor Shadrack Ruto. Pastor Ruto introduced Ronald to The Bucket Ministry. 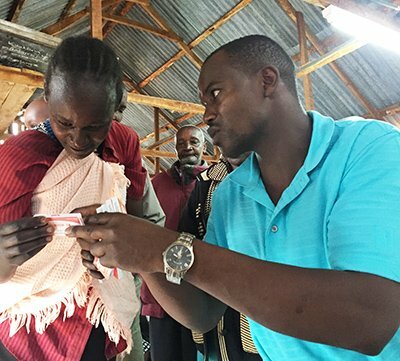 Ronald says this was a “turning point for him” when he met people (The Bucket Ministry team) of a different culture, race, and status that traveled thousands of miles to help with the health (both physical and spiritual) of people living in very remote areas of Kenya. Ronald worked with the team to deliver water filters, de-worming medicines and the the MOST IMPORTANT…the word of God to the villages they visited.